The International Dentist Program participates in the ADEA Centralized Application for Advanced Placement for International Dentists (CAAPID). Applications for the 2019- 2020 International Dental Progam (IDP) will open on March 5, 2019. The 2020 application deadline is August 5, 2019. 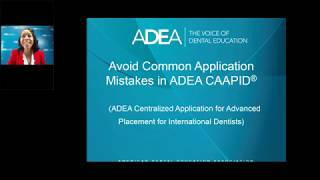 Please watch the ADEA Introduction to the CAAPID Application video. For more information, view the instructions online, or please contact ADEA CAAPID by phone: 617-612-2035 or by e-mail. Please note that CAAPID does not take part in student selection. Please go online and complete your CAAPID application to our IDP Program. Applicants must submit a detailed Educational Credential Evaluator [ECE] course-by-course evaluation to ADEA CAAPID. Our school does not accept the World Education Services [WES] evaluation. Our program requires passage of Part I NBDE to be considered for admission. Applicants who have passed NBDE Part II will be given preference for admission. You must make arrangements to submit official NBDE Part I & Part II scores to CAAPID directly. Our committee must see official NBDE score reports in your CAAPID portal by our August 5, 2019 admissions deadline. The committee will not know if you passed NBDE Part I and Part II in your online CAAPID application unless you submit official scores to CAAPID. Applicants with NBDE scores older than 2012 must submit official NBDE score reports to our office directly. Official NBDE scores must be seen in the CAAPID portal by our August 5, 2019 admissions deadline. Applicants must submit three Letters of Evaluation through the ADEA CAAPID portal. Letters should come from academic faulty or dental professionals who can best attest to your skills, abilities, and personal attributes. No additional letters will be accepted. Please do not submit letters directly to the school. Letters submitted via e-mail or by paper mail outside the CAAPID portal will not be considered. Letters can be no older than three years. For the 2020 CAAPID cycle, our committee will only accept recommendations from 2017, 2018, and 2019. These letters must be submitted directly from the evaluator to the online CAAPID portal. The letters are to be on official letterhead and be signed by the evaluator to be official. Your application will be considered incomplete without these two requirements. Please inform your evaluators of the importance of the requirements prior to submitting your application. Only three letters will be considered. No additional letters will be accepted. Do not send letters directly to the University at Buffalo. Evaluators should submit letters of evaluation in the Evaluation section of the “Supplemental Materials” section of the ADEA CAAPID application. Applicants whose native language is not English are required to take the TOEFL with a score at or above minimum of 79 internet-based. TOEFL scores of 90 or better are considered competitive by the admissions committee. TOEFL scores must be obtained within two years of the start of the program (May 1, 2018 and after for 2020 admission). Applicants with TOEFL score reports dated from January 1 – April 30, 2018 will be considered for review by the Admissions Committee. If selected to bench test and interview, candidates with January 1 – April 30, 2018 scores will be asked to submit an updated TOEFL prior to our interview day to meet our admissions requirements and submission timeframe (two years from the start of the program). All applicants must submit official TOEFL scores through the CAAPID portal. Our committee must see valid, official TOEFL scores in the CAAPID portal by August 5, 2019 admissions deadline. The committee will not know your TOEFL scores unless you submit official scores to your online CAAPID application. IDP interview dates have no bearing on TOEFL score timeframes. We adhere to program start date to determine TOEFL score timeframes. Other dental schools have different TOEFL policies. Please be sure to consult with each specific school you apply to for their individual TOEFL policy. Our program does not accept the International English Language Testing System [IELTS] exam to meet our English Language Proficiency requirement. The Supplemental Application Fee of U.S. $85.00 must be received by the School of Dental Medicine by the August 5, 2019 application deadline. The application fee is non-refundable and is not credited toward any charges when an accepted applicant registers as a student. We require electronic submission of the application fee via credit card or e-check. Please note the $85.00 USD supplemental application fee is a separate fee from the ADEA CAAPID application. In order for your IDP application to be processed and reviewed, we must receive your $85.00 supplemental application fee. Following initial review of applications, the IDP Admissions Committee will invite a number of applicants to come to the School of Dental Medicine for an interview, dexterity and case study testing. A personal interview is required for admission, but does not guarantee acceptance. Interviews will be granted after the applicant’s credentials have been reviewed. The Admissions Committee will review all applicants, but will only invite qualified applicants to participate in the interview process. Interviews are by invitation only. The interview process consists of an orientation to the School of Dental Medicine, faculty interview, and a bench testing pre-clinical exercise. The fee to sit for the bench test is non-refundable. The Admissions Office will contact selected candidates directly via e-mail, and will provide more information about the interview. All candidates are expected to confirm their attendance for the interview. Candidates invited to interview will be provided with detailed information on how to remit the bench testing fee, and how to plan their travel to Buffalo for the interview and bench testing. Each interviewee is responsible for his or her own visa, travel and expenses. The University at Buffalo offers a preparatory course in restorative dentistry for international dentists. This course is optimal for those who may need better preparation in fixed and removable prosthodontics, operative dentistry, and treatment planning for the testing required by most U.S. dental schools as part of their admissions process. Please note that this course is not a prerequisite, nor does it guarantee admission to any dental school. Upon completion of the interview process, the Admissions Committee will evaluate and offer provisional acceptances to those selected. Admission offers generally begin two to three weeks after bench test and interviews are completed for all students. However, our committe will continue to make offers until our IDP class is full. Please contact our IDP Admissions Committee if you are unable to find an answer to your question. What is the deadline for applying to IDP at the University at Buffalo? The application deadline is August 5, 2019. When should I apply to the University at Buffalo? The 2019 CAAPID application cycle opens on March 5. Early application is encouraged to remain competitive. If I applied in a previous application cycle, do I have to submit an application through CAAPID again? Yes. Returning applicants will need to submit a new application along with required documents through CAAPID. Who should I contact if I have questions about the CAAPID IDP Online Portal? Is there a supplemental application for the University at Buffalo? No. There is no supplemental application. However, there is a $85.00 USD supplemental application fee. What materials should I send directly to University at Buffalo? There is a required $85.00 USD supplemental application fee and can be submitted to our EPAY system. No additional documents are to be sent directly to the program, only to the CAAPID portal. Do I need to wait for Buffalo to send me an email before submitting my $85 supplemental application fee? No. All applicants are required to pay the $85.00 USD supplemental application fee by the application deadline in order for their application to be processed and reviewed. We will send supplemental fee payment confirmation or a reminder to submit supplemental application fee. No exceptions will be made for a late supplemental fee payment after the August 5, 2019 admissions deadline. Can I submit the $85 supplemental application fee before I submit my CAAPID application? Yes. The $85.00 USD supplemental application fee payment can be made prior to submitting the application. Our committee will match up your supplemental fee to your CAAPID application. Once submitted, supplemental application fees are non-refundable. What agency’s course-by-course evaluations does your school accept? Does the IDP program have a minimum GPA for admission consideration? There is no minimum GPA required for admission consideration. Our admissions committee understands that IDP applicants come from various countries and that ECE GPA’s can vary between institutions. We take this into consideration when evaluating applicants. Please pay close attention to our TOEFL requirements. Other dental schools have different TOEFL policies. Please be sure to consult with each specific school you apply to for their individual TOEFL policy. May 1, 2018 and after for 2020 admission consideration. TOEFL score reports dated before January 1, 2018 will NOT be considered for review. Your CAAPID application will be considered incomplete. In order for your CAAPID application to be considered for review by the committee, TOEFL scores must be January 1, 2018 or later. In your online CAAPID application, if your native language is not indicated as English, then you are required to submit an official, valid TOEFL score directly to CAAPID. I am an international student but I have lived in the U.S. for a while. Do I still need to submit TOEFL? Yes. The only exception is if you indicated your native language as English in your online CAAPID portal. Am I exempt from taking the TOEFL when I have earned a degree from a U.S. college/university that did not require me to take a TOEFL since my English is good/proficient? No. The only exception is if you indicated your native language as English in the online CAAPID application. How old can my TOEFL scores be for admission consideration? Applicants whose native language is not English are required to take the TOEFL with a score at or above minimum of 79 (internet based) or better obtained within two years of the start of the program (May 2018 for 2020 admission). TOEFL score reports dated from January 1 – April 30, 2018 will be considered for review by the Admissions Committee. What if I have taken the TOEFL examination, but the school will not receive the results until after the application deadline? The official, valid TOEFL score must be seen in your CAAPID portal by our August 5, 2019 admissions deadline. If an applicant submits a secondary official TOEFL score after August 5, 2019, it may or may not be considered depending on where the IDP Admissions Committee is in the cycle. Is there a minimum TOEFL requirement required for admission consideration? Yes. the minimum University at Buffalo IBT total score is 79. However, a score of 90 or better is considered competitive by the Admissions Committee. Can I apply to CAAPID now and submit the TOEFL later? Yes. You can apply first, but the official, valid TOEFL score must be seen in the CAAPID portal by our August 5, 2019 admissions deadline. Can my application be reviewed by the Admissions Committee without a TOEFL score? No. Your application will be considered incomplete without an official, valid TOEFL score. The only exception for not submitting a TOEFL score is if your native language is indicated as English in the CAAPID portal. Applicants are able to self-report their test results from the ETS TOEFL within the ADEA CAAPID application for either the internet-based test (iBT) or paper-based test. Applicants must submit official TOEFL score reports directly to ADEA CAAPID. Official score reports are accepted directly from ETS only and must be provided electronically. To have your official TOEFL scores sent directly to ADEA CAAPID, please request scores to be sent to the score code for institution B451: American Dental Education Association’s ADEA CAAPID. What is the Institution Code to send my official TOEFL score to CAAPID? The CAAPID institution code is: B451. Please don't enter the University at Buffalo's institution code. Your official TOEFL scores must be reported to CAAPID. I have submitted my application materials to CAAPID, when will it be processed by the University at Buffalo? Your application will be processed when your CAAPID status is “Complete” and your $85.00 USD supplemental application fee has been paid. Will I receive any notification regarding the completion of my application from your school? Yes. Applicants will be notified via e-mail once their application is complete. Our committee will notify applicants if any additioanl application documents are required to complete their application. Will my application be reviewed if a document is missing? No. Our commitee will only review completed IDP applications. I received an e-mail from the University at Buffalo notifying me that my application is complete. When can I expect an update on my status? Once your application is complete, your application will be sent to the Admissions Committee for a full file, formal review. The formal review process can take several weeks. Candidates will receive all application status updates directly via e-mail. Our committee does its best to keep candidates apprised of their status at all times. Please feel free to contact our admissions office with any additonal questions. What happens if I submit my CAAPID application on your August 5, 2019 amissions deadline date? Applicants are highly encouraged not to wait until the August 5, 2019 deadline to submit their CAAPID application. Applicants who apply on or near the ADEA/CAAPID deadline, must take full responsibility to complete both the CAAPID application and University at Buffalo requirements by the August 5, 2019 admissions deadline. Candidates who have not submitted a completed application by August 5, 2019 will not be considered for the 2020 cycle.